This week, I decided to use my Scarf Swap scarves as the starting point and inspiration for my outfits rather than a finishing touch. First up is this cute little number that Jessie sent me. The colors and lines have a nautical feel to me, so I decided to pair it with a casual weekend look featuring horizontal stripes, bright red shorts and gold accessories. Using scarves as turbans or headwraps is definitely a favorite style of mine, especially for carefree, on-the-go looks. Jessie knows how to rock a turban (check out her tutorial video! ), so I thought she'd approve. I was also inspired to knot my shirt by fellow scarf-swapper Kendi. It's so much easier than tucking a voluminous top! 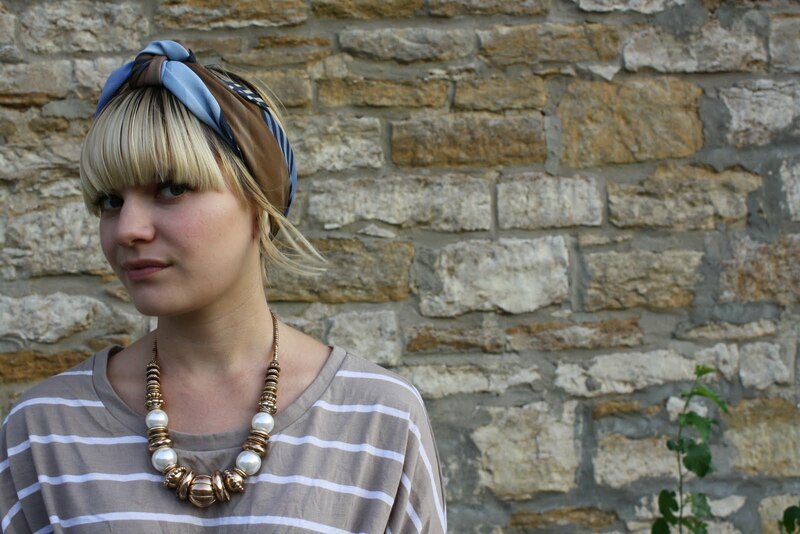 Check back to see other ways I like to incorporate scarves into my wardrobe. Very cute and fifties-ish. Beach-ready but urban too. those SHOES! wow. super cute. Almost purchased that shirt too, but I love the way you styled it! Love those shoes, I feel like they would match everything! p.s. you are on my blog roll ..hope you can stop by. Can you show us how you tied your scarf? Holy cow! I wore almost the exact same thing on Sunday and I hadn't seen your blog until just now! Wow!